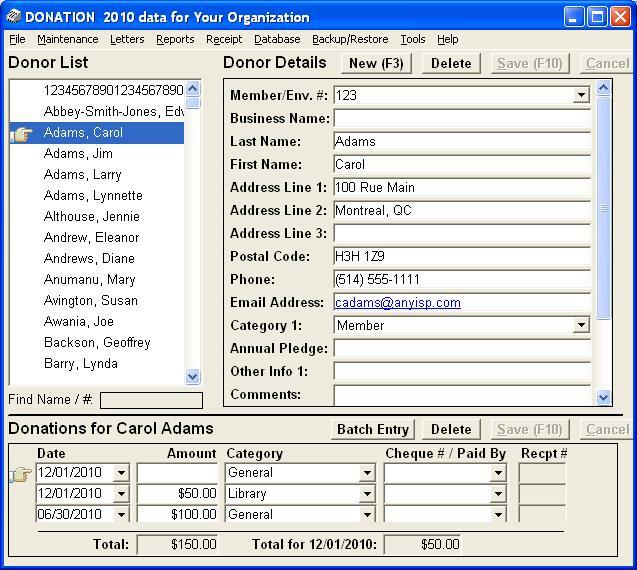 Easily track your charity's or church's donors and donations, and issue charitable receipts, with the DONATION software program. DONATION is an easy-to-use, affordable, and powerful solution best suited to small and mid-sized organizations. Intended primarily for record-keeping of donors and donations, issuing receipts, reporting, and mail-merge, DONATION is not a fundraising system. (If that's your requirement you might want a more full-featured and customizable fundraising program - that's also more expensive!) Over 7,000 registered users in churches and charities in the U.S., Canada and around the world make DONATION their program of choice. Your product just gets better and better. It is so user friendly and how you have it set up just makes sense for the average user. It's simple enough yet detailed enough and you can customize it to fit your needs so easily. "I LOVE THIS PROGRAM! ... every year it just gets better and better." - A church administrative assistant. Check out DONATION demo videos and screen images. Read about how DONATION can help you and your charity, church or non-profit. Get the latest DONATION news, and sign up to help improve DONATION as an advisor or beta tester, on our blog. For smaller charities and churches, explore the free DONATION Lite version. FREE DOWNLOAD Click to select your free Lite version or 60-day evaluation copy of the full paid version of DONATION.